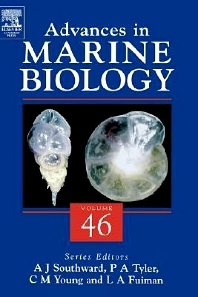 This new volume of Advances in Marine Biology contains reviews on a wide range of important subjects such as: Benthic foraminifera (Protista) and Deep-Water Palaeoceanography; Breeding Biology of the Intertidal Sand Crab Emerita (Decapoda, Anomura); Coral Bleaching and Fatty acid trophic markers in the marine environment. Advances in Marine Biology has been providing in-depth and up-to-date reviews on all aspects of Marine Biology since 1963 -- over 40 years of outstanding coverage! The series is well-known for both its the excellence of its reviews as well as the strength of its thematic volumes devoted to a particular field in detail, such as 'The Biochemical Ecology of Marine Fishes' and 'Molluscan Radiation'.